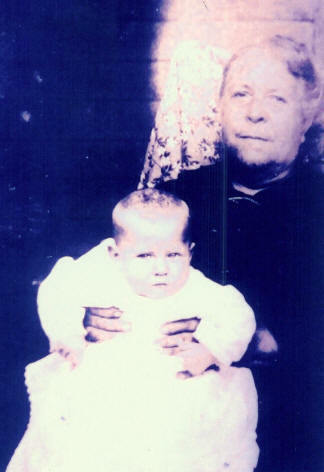 Frances "Fannie" Elizabeth Douglas was born 05 Mar 1860 in Iredell County, NC, to J. Walter Douglas and Mahala Catherine "Haley" Miller. 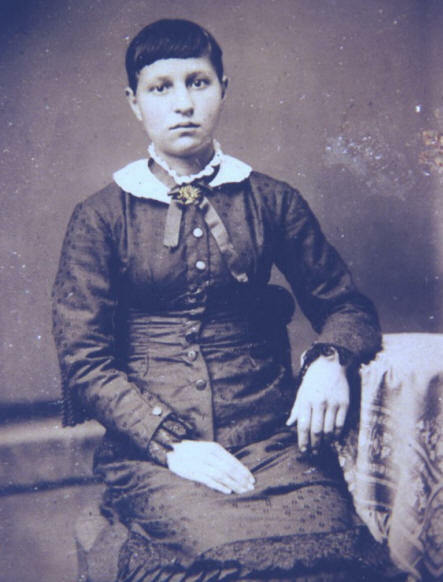 Frances Elizabeth was called Fannie by her family and friends. Some documents list Fannie's birth date as 1860 while others list it as 1861. Fannie's headstone at Sharon Lutheran Church in Iredell County, NC, says that she was born in 1861. The most important document, however, is the 1860 Census. On this document F.E. Douglas is listed as being 3 months old. 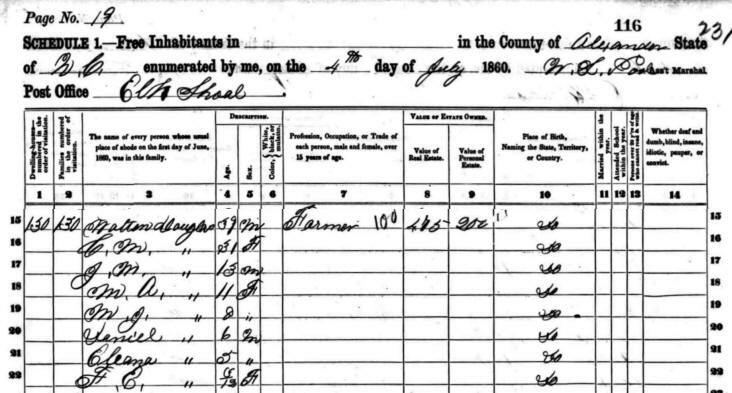 Fannie could not have been listed on the 1860 Census if she wasn't born until 1861. 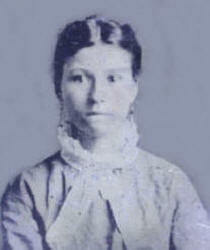 Walter had been married to Susan Stewart, but after her death he married Mahala Catherine Miller in 1859. 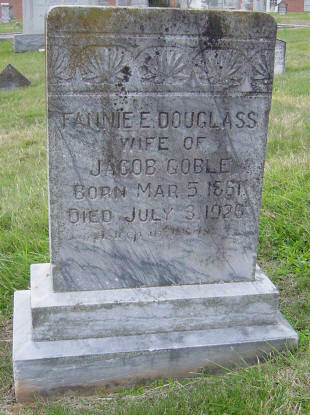 Fannie married Jacob Hedrick Goble on 10 Dec 1884 at her family's home in Alexander County, Miller's Township. Her marriage license lists her age as 23, but she would have actually been 24. Jacob was also 24. The 1860 Census shows Mahala "C.M." 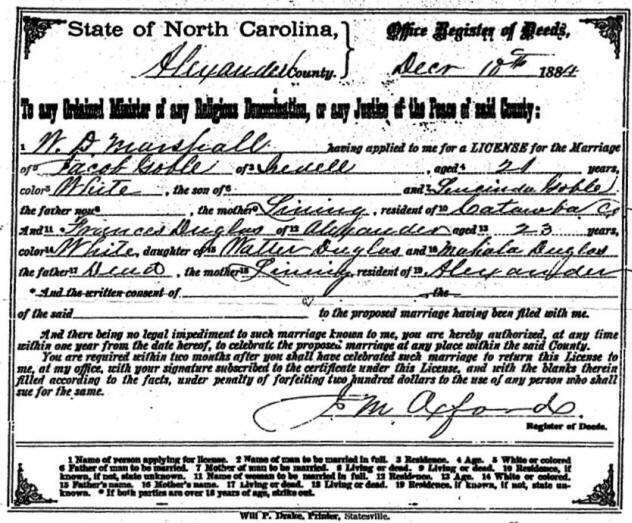 married to Walter/Walton and living in Alexander County, NC, with his 5 children and their daughter Frances "Fannie" Elizabeth (F.E.) who was three months old. 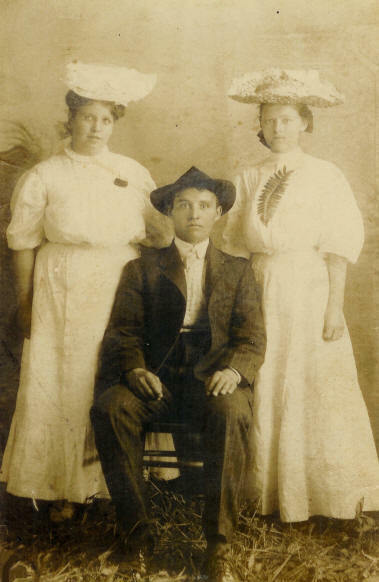 The 1880 Census shows Fannie (age 20) and her mother Mahala Catherine Miller Douglas (age 50) living with Mahals's son David James Fulbright (age 24)and his family. David was a half-brother to Fannie. 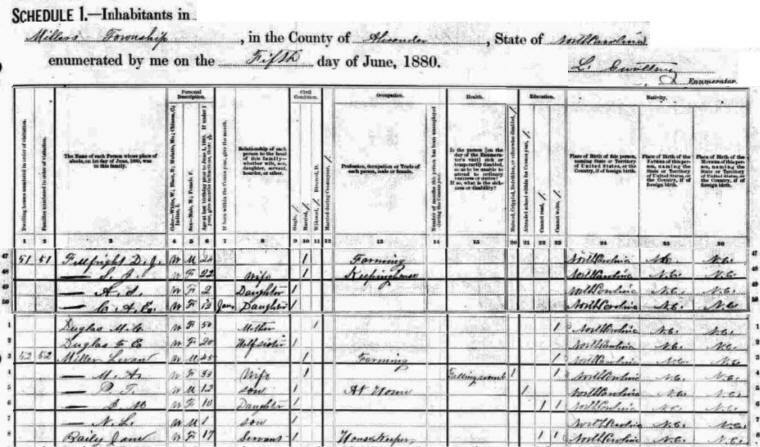 David's family listed on this Census were his wife Sarah Jane Fulp Fulbright (age 22), and their children Arabella Samerimus Fulbright (age 2) and Cora Anthony Elizabeth Fulbright (age 5 months). 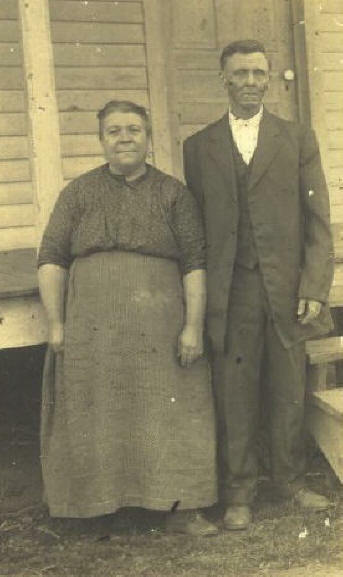 Fannie married Jacob Hedrick Goble on 10 Dec 1884 in Alexander County, NC. They were both 24 even though the document lists her age as 23 and his as 21. Fannie is listed as having had 5 children but only 4 were living. It's been suggested that the above left photo is of Fannie and her two children Martin & Eliza Jane. 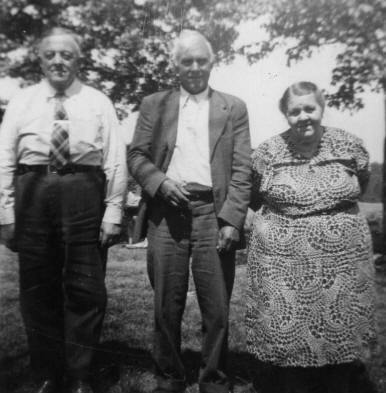 My copy of the photo came from the collection of Beulah Vernesta "Nessie" Johnson Goble - wife of Martin Luther Goble and daughter-in-law of Jacob & Fannie. The back of the photo lists those in the photo as, "Fannie + Jack Goble (Jacob) + daughter Beck (Sarah Catherine Rebecca "Becky"). Fannie died 03 Jul 1926. She is buried at Sharon Lutheran Church in Iredell County, NC. 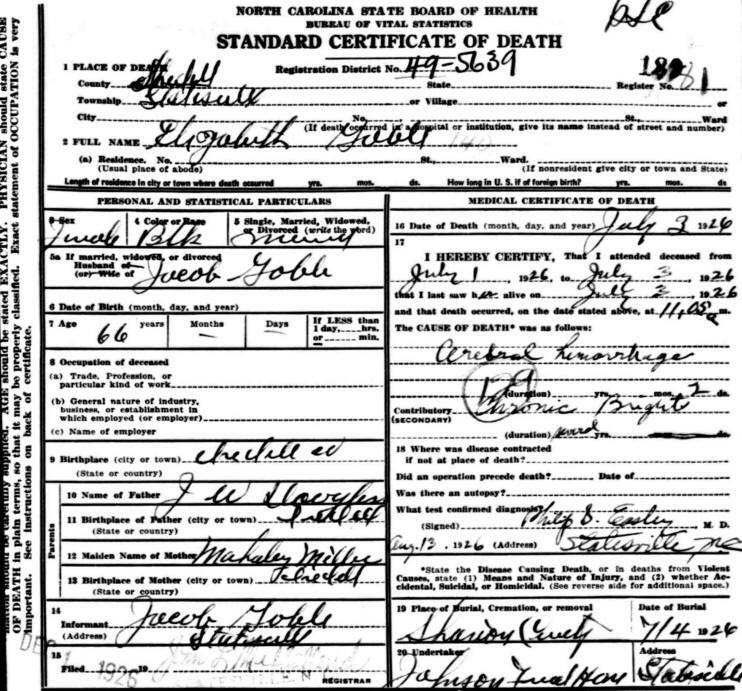 Fannie's Death Certificate shows her father as J. W. Douglas and her mother as Mahaley (Mahalah) Miller. The cause of death was "cerebral hemorrhage" and she was 66 years old. Her race was incorrectly listed as "Blk" (Black). If you have photos are additional information on Frances Elizabeth Douglas, please contact me. A special thanks to Boyd & Becky Goble and Brenda Isenhour Schronce for the photos of Frances Elizabeth Douglas and her family.